Ah, kale salad. I googled "kale salad recipe" and received nearly 3 million results. Kale (and kale salads) are trendy, and for good reason - kale salads are nutritious, delicious, and make use of the hardiest of winter greens. There is so much to love about this kale salad - the sweet-tangy peanut dressing, the colorful and crunchy veggies, the satisfying protein boost from tempeh and peanuts ... so scurry off to the grocery store and grab some kale, quick! Cook the tempeh: bring a small saucepan of water to a boil. Add the tempeh, turn the heat down to low, cover, and simmer the tempeh for 10 minutes. Drain and cool slightly. Grill the tempeh, or pan-fry in a teaspoon or two of oil until golden brown. Season with salt and pepper, and cut the tempeh into cubes. Cool. Pack the salads: divide the dressing evenly among 4 tall quart-sized containers. Layer the tempeh, carrot, bell pepper, and kale in the jars. 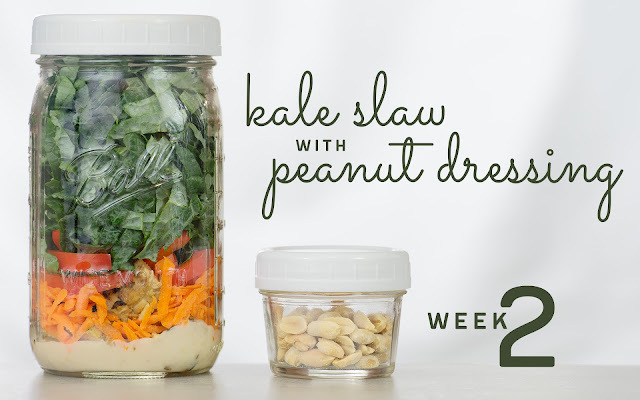 Divide the remaining peanuts evenly among 4 2-ounce jars or snack-size zip-top bags for each salad. Refrigerate until serving. Enjoy your salad: invert your salad onto a plate or into a bowl. Top with peanuts. NOTE: I call for "dinosaur" kale in this recipe, simply because I find the flat leaves easier to prep, but you could certainly substitute regular curly green kale if that is what you prefer or what is available at your local market. 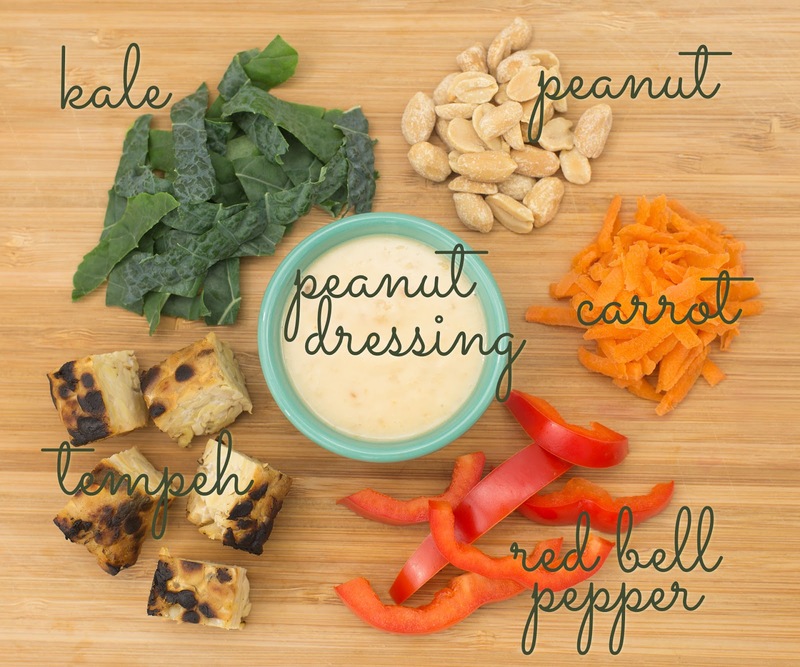 TIME-SAVING TIPS: Substitute your favorite prepared peanut sauce for the peanut dressing. Substitute 1 cup prepared julienned carrot for the shredded carrot. Substitute pre-washed, bagged baby kale for the shredded kale. SPECIAL DIET SWAPS: This salad is vegan as-is. For gluten-free diners, choose oil, vinegar, and tempeh labeled "gluten-free." Substitute salted sunflower seeds for the peanuts to accommodate peanut allergies. This salad sounds delicious and the graphics are beautiful! I am loving all the pictures and recipes :) 2 down, 50 to go!